An ISO 9001:2015 accredited company. Leading & Reputed company with 24 years of rich experience in the electrical panel manufacturing industry. Cost Effective design & manufacturing of high quality Electrical Distribution & Control Panels with timely delivery and prompt after sales service. Gaining repeat orders from wide range of Clients and approved in the list of most of the leading MEP consultants. To grow and be a reputable leader in the electrical panel manufacturing industry across India.Create values for our end customers with tailor-made electrical panels of superior quality standards on the grounds of technicality and service. At Abak Electrofab Engg we believe in International Quality Standards.Our duty is to provide superior services in our industry while consistently exceeding our customer’s quality and timely delivery expectations.Our objective is to develop long-term relationship with our clients, and servicing them through the delivery of integrated solutions that benefit their business requirements. 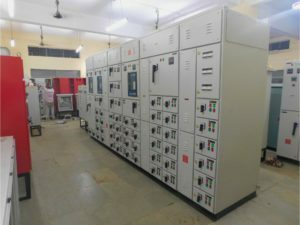 In our presence in the field of Electrical Distribution & Control Panels since more than 24 years, we achieved remarkable growth, success and are thriving to gain more heights. We believe in working together as a team to deliver cost effective quality products & services to our customers to meet all their expectations. In order to achieve quality, we provide all the inputs and raw materials used in the manufacturing of electrical panels, from highly reliable, tender approved & branded sources, which are inspected thoroughly before accepting it into our store and facility. Abak Electrofab Engineering Pvt. Ltd had carried out the engineering & supply of Main LT Panels, Bus Duct, Fire Emergency Panel, Elevator Panels for our various IITB projects. All the panels are functioning smoothly. We had procured Main L.T. Panels, Air Insulated Bus Ducts, Fire Emergency Panel, Lift Panel, Floor Panel, etc for our various IIT-Bombay (Indian Institute of Technology, Bombay) Mumbai Project from Abak Electrofab Engineering Pvt.Ltd. We had visited their factory with the IITB Authorities for the pre-dispatch activity of our said package & we were fully satisfied with the manufacturing facility & testing facility developed by them. All the panels or running satisfactorily without any trouble till date. We are also satisfied with the service provided by Abak Electrofab Engineering Pvt.Ltd. 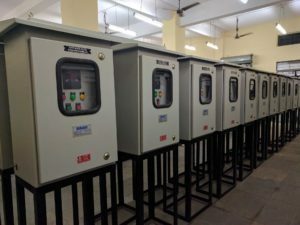 Abak Electrofab Engineering Pvt.Ltd had manufactured & supplied Power Control Panel, Motor Control Panel & Street Light Control Panel. The work performance of the power panels is good. Abak Electrofab Engineering Pvt. Ltd had designed, manufactured & supplied Main LT Panels, Distribution Panels, LT Bus Duct & APFC Panels through Leena Power Engineers Pvt Ltd for CIDCO Exhibition & Business Centre at Vashi, Navi Mumbai. The work performance of the power panels is trouble free & has been operational since May 2014. Overall Performance of Abak Electrofab Engineering Pvt. Ltd is also efficient. Abak Electrofab Engineering Pvt. Ltd had manufactured & supplied LT Panels through Ashok Electricals for Custom Office Building at Alibaug, Maharashtra. They are our approved LT panel manufacturers. The work performance of the power panels is good and efficient & has been operating trouble free since August 2015. Abak Electrofab Engineering Pvt. Ltd had carried out the engineering & supply of various LT Panels, Main Panels, Fire Panels, Lift Panels, Meter Panels & APFC Panels of various ratings for our different projects at Madhya Pradesh, Goa, Khalapur, Navi Mumbai & Pune. Panels are working smoothly without any interruptions since 2014. Abak Electrofab Engineering Pvt. Ltd had supplied numerous panels – APFC Panels, Main LT panels, Meter Panels. Panels met our quality parameters & have been functioning smoothly since 2015.